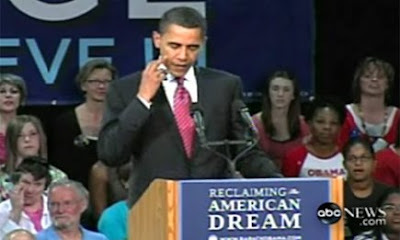 Barack Obama scratched his face using a middle finger while mentioning Hillary. And the L.A. Times reported the story as if it were hard news. That whizzing sound you hear is the Chandler family spinning in their graves. Funny how the mainstream media never bothered to cover a far more important middle-finger incident. This is Gunnery Sergeant "Iron" Mike Burghardt flipping off insurgents after surviving an IED explosion -- literally between his legs -- in 2005. The Times couldn't bother covering that story then, however.